Politics, as a rule, is pretty thankless, according to some experts. I suppose they’re referring to the constant levels of stress produced when one’s being judged by so many people, with different motives, which are sometimes irreconcilable. This is true: not many people give up their peaceful lives to ‘complicate’ themselves with politics. But once in a while, funny things arise, even from your worst detractors. This is the case with Percy Alvarado’s last post, which has made laugh a lot and we’re publishing below. One way to help intelligent, wise people get to know you better is through the critiques of adversaries, who in their eagerness to do damage can show their own weaknesses. Here’s the post, and below it, my short reply. Enjoy. Eliécer Ávila has become, in fact, a posterboy for the anti-Cuban ideological war, vainly trying to push forward a flawed project, flawed because the counter-revolution will never be greater than the Cuban people. We revolutionaries, like it or not, Somos Más — We Are More. Somos Más, the small counter-revolutionary group, was founded in March 2013 by Eliécer Ávila Cicilia, an engineering graduate from the University of Information Sciences (UCI), who tried to force his way into splinter groups financed to maintain anti-Cuban media aggression. Ávila was the first who would become one of the so-called mercenary travelers, making a tour between February 2 and May 26, 2013, thanks to the recently passed Migration Law and financing obtained for his projects from abroad. On this occasion, his trip was financed by a social network named La Cubanada, based in Sweden and run from the house of one of its promoters, Alexis Ferrer. The trip also included countries such as Belgium, Germany, the Czech Republic, Spain, France, Holland, Poland and the U.S.
Eliécer participated alongside another mercenary, Yoani Sanchez, a mercenary in multiple events and exchanges in the Czech Republic, where she hooked up with the Cuban American National Foundation (CANF), by way of Omar López Montenegro, one of the group’s directors and staff member at the badly named Radio Marti. The appearance of the group “Somos Mas” a week later was no surprise, then, after it had received the blessing of CANF and the promise to prop it up it as a future opposition party within the Island. From this moment, it could count on sufficient financing from this terrorist group and on the support of Radio Marti’s media infrastructure, as well as other anti-Cuban media. It’s known that as part of the agreement established between CANF and Ávila, they planned to announce, by way of Yoani Sánchez in Mexico, the creation of the digital counter-revolutionary outlet that became 14yMedio. By express direction of CANF, Eliécer began to actively use social networks, trying to spread his “political project”, including sending letters to various Cuban press outlets and other websites to incite a crusade in support of “free access to the Internet for Cubans”, which would culminate on May 17 of this year. Ávila’s trouble-making was also directed toward cajoling Cuban residents abroad, above all in Sweden and Germany. During the before-mentioned trip, Eliecer Ávila met at the French university Paris-Sud, following a meeting suggested by right-wing parties in that country, with Séverine Fogel, director of International Relations and the chief of that center’s Department of Development, Emmanuel Waller, to publicize study options for young technology workers who are “unemployed” in Cuba. 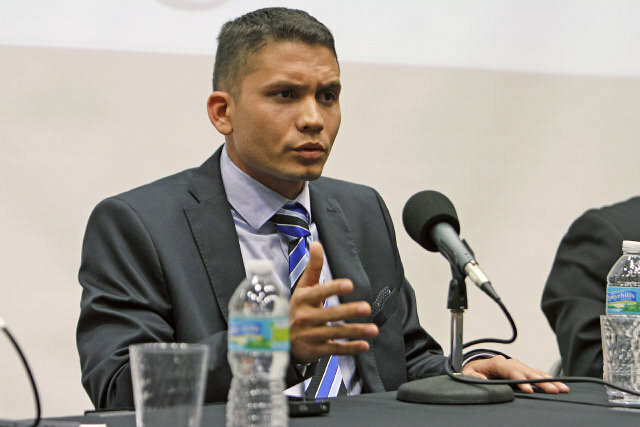 Already counting on the support of CANF, he was received at the State Department during his stay in the U.S., promoted alongside Coco Fariñas on Radio Marti and invited to a talk hosted by the Department of Philosophy and Arts at Miami Dade College, where he made the most of his role as distorter of Cuban reality. Aware of the criticism received by other small-time counter-revolutionary leaders, he has outwardly defended an “obligatory transparency around finances” that come from abroad to support his subversive work. Within his proposals is the reduction of the Revolutionary Armed Forces and “refounding” the Ministry of Interior, disconnecting it from its revolutionary ideology. At the same time, he aligns himself as a supposed opponent of the so-called embargo against Cuba, though he does it out of mere political convenience. He made these positions clear in a meeting with U.S. senators who have visited the island, always with the blessing of the former U.S. Interests Section in Havana. He also attended a meeting organized in the offices of the newspaper 14yMedio with the Under Secretary of State, Roberta Jacobson, where he defended ideas related to telecommunications, technology, the production of goods and services for small businesses, at the same time he argued that the new climate is going to favor the tactics of the internal counter-revolution. His role as trouble-maker has been brought to light in various regional meetings, among them the Summit of the Americas, where he carried the counter-revolutionary mantel and held forth on the necessity of destroying the Cuban Revolution. He maintained the same position at the “Thinking about Cuba Today” event, in the Faculty of Philosophy at the University of Barcelona (UB) and at the Cuban National Conference, celebrated in San Juan, Puerto Rico last August. On Tuesday, July 28, Eliécer Ávila was received at the estate of the Sociedad Rural Argentina by the right-wing Argentine national legislator, Cornelia Schmidt-Liermann, of the Union PRO party and president of Parladem (Parliamentary Group for Democracy), which have become supporters of counter-revolutionary groups en Cuba thanks to Micaela Hierro Dori and to Marianna Paula de Giuli, well-loved scoundrels recognized by the National Endowment for Democracy. In 2015 there was an upturn in media manipulation by Somos Más, starting in July, under the command of the mercenary Manuel Díaz Mons who is the group’s national coordinator until 2016, when the group will determine its internal leadership structure for the next four years. Besides, the lawyer Wilfredo Vallín will help it file paperwork to be listed on the Cuban Registry of Associations. Through other means, the Movement supported proposals for a new Electoral Law, and held virtual contact with its first supporter club in Hollywood, Florida. In its summary of “ideas and principles”, Somos Más states that it will finance itself through “a fee” that each member “will contribute voluntarily.” It points out that the movement’s leadership will be the responsibility of “a committee of five members plus a secretary”, of which only one can reside abroad — which he appears to intend to do, since he practically already spends his life traveling and enjoying good hotels and a comfortable life as a tourist politician. Distinguished Mr. Percy: I have carefully read your article, after it was sent to me by a friend who often brightens my days with amusing things he finds on the web. I can’t deny I enjoyed reading it, since as part of your scant readership, I feel privileged to be a source of inspiration for your texts. To know that you go to bed thinking of me (even if it’s to attack me) excites a rare pleasure, although without pretending to deceive you, I admit that the same has never happened to me. The quality of your essays continues to get worse, if that is even possible. I ask myself if it’s because you’ve lost your importance in the apparatus and they no longer let you see important information, or at least up-to-date information. Throughout all you’ve written, I can’t tell whether you accuse me or flatter me, because with almost all of it, I’d agree … proudly. In fact, now that I think about it, you shouldn’t have Internet access, because if you did, above all to videos, you wouldn’t repeat as “news” what is already so well explained everywhere else. Nevertheless, if you want to continue in depth this debate, and many others, including more interesting ones, I invite you to have it on television, in front of all Cubans and in from of the entire world. He who has no fear doesn’t hide! Do you accept? Date? Time?